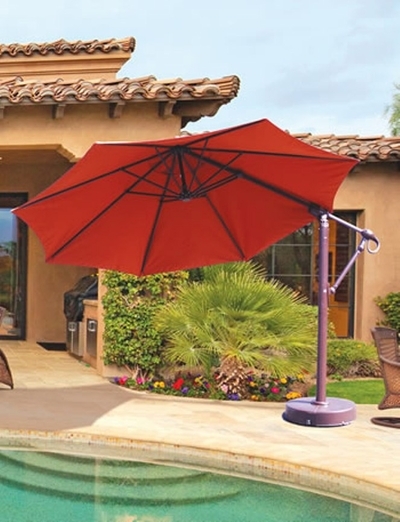 Spend a little time in the shade this season with the Galtech 11' ft. cantilever outdoor umbrella that will keep your patio, pool, spa or open-air space cool and comfortable under the hot sun. This is a sizable patio umbrella that can cover your larger outdoor dining tables or shade your luxurious deep seating set. Take the time to kick back and relax, enjoying meals and great conversations with family and friends. The popular Antique Bronze powder-coated finish on the aluminum pole is designed to compliment many styles of outdoor furnishings and is able to withstand the harshest weather elements without the worry of rust or corrosion. The exclusive Easy Open Lift system allows you to open and extend the cantilever arm in one simple motion with ease. A 75-pound resin base that fits up to 100 lbs. of sand or gravel will securely weigh the umbrella down ensuring it stays in place. This is an upscale addition to your outdoor environment that is sure to impress.